Elements Eight, the single distillery rum from St Lucia, is celebrating its 10th anniversary since its inception at the London Bar Show in July 2006. The brand is relaunching with revamped packaging and a focused portfolio. Elements Eight Platinum, one of the pioneering rum brands - it was the first aged white rum. Platinum is aged for up to four years in Kentucky Bourbon barrels and lightly charcoal filtered to remove colour. Nick Gillett, managing director, Mangrove (UK distributor), comments: "Mangrove is excited to be launching the new packaging of Elements 8. It is the perfect way to celebrate this fantastic rum, which set the category alight with its previous bottle in 2006." 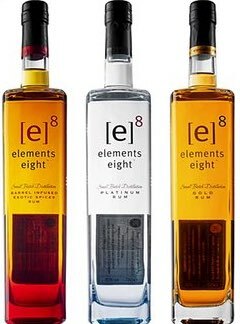 Elements Eight is a complex blend of eight single distillery rums and crafted from eight individual elements – terroir, cane, water, fermentation, distillation, tropical ageing, blending and filtration. The new look, created by The Brand Foundry, is designed to take Elements Eight into the next decade of its journey.